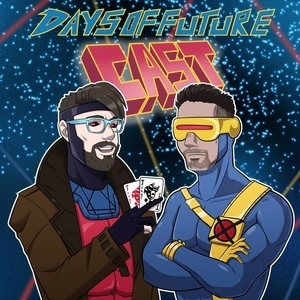 66 episodes of Days of Future Cast since the first episode, which aired on October 8th, 2016. Jeremy and Gary read your responses and questions, then get a little gross. Jeremy and Gary end graduation day with Jack the Ripper, Professor Xavier, and MEGATHOT. Jeremy and Gary meet Captain America and some Kentucky rednecks. Streaming live over the internet, Jeremy, Gary, and some friends talk about The Wolverine. Storm is an idiot, and Nightcrawler is there too. Isn't a man entitled to the sweat of his, uh, leg? Gary and Jeremy finish talking about the Beyond Good and Evil saga, despite trying desperately not to. Gary and Jeremy discuss bathroom habits and almost forget to talk about X-Men: The Animated Series. Oops. Gary and Jeremy spend their "X Mas" in the sewers asking the important questions about everyone's favorite mutant: Table Boy. Gary and Jeremy discuss the unpleasant origin story of Scarlet Witch and Quicksilver, then go do chores with Wolverine at Stereotype Mountain.